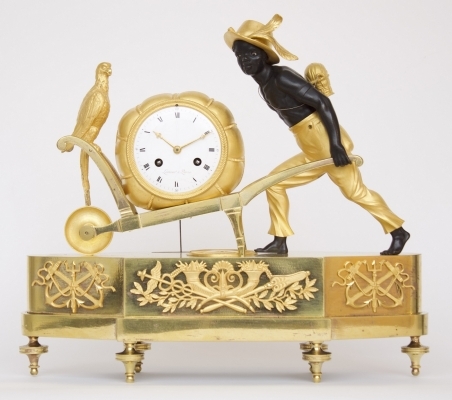 8-day movement with half hour striking, fine ormolu and patinated bronze case. 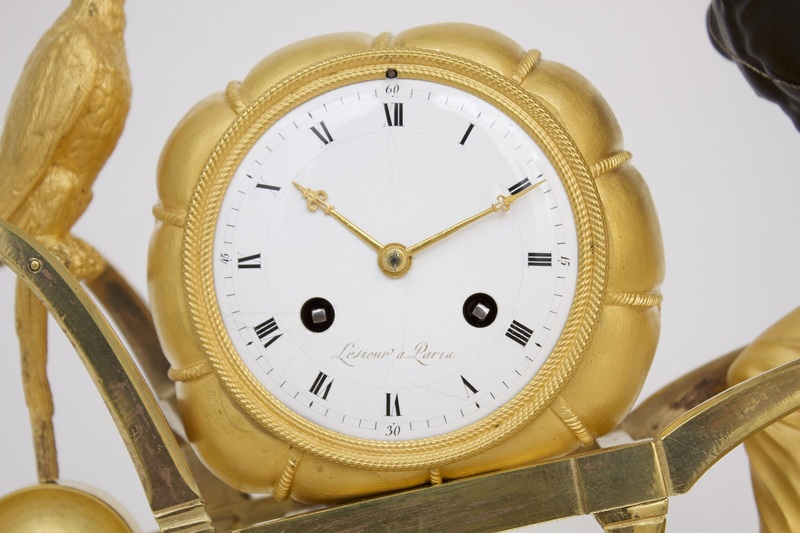 The 8.5-cm enamel dial has Roman numerals and is signed in gold Lesieur à Paris. The fine pierced and engraved hands are made of gilt brass. The movement is driven by two spring barrels and has a duration of eight days. 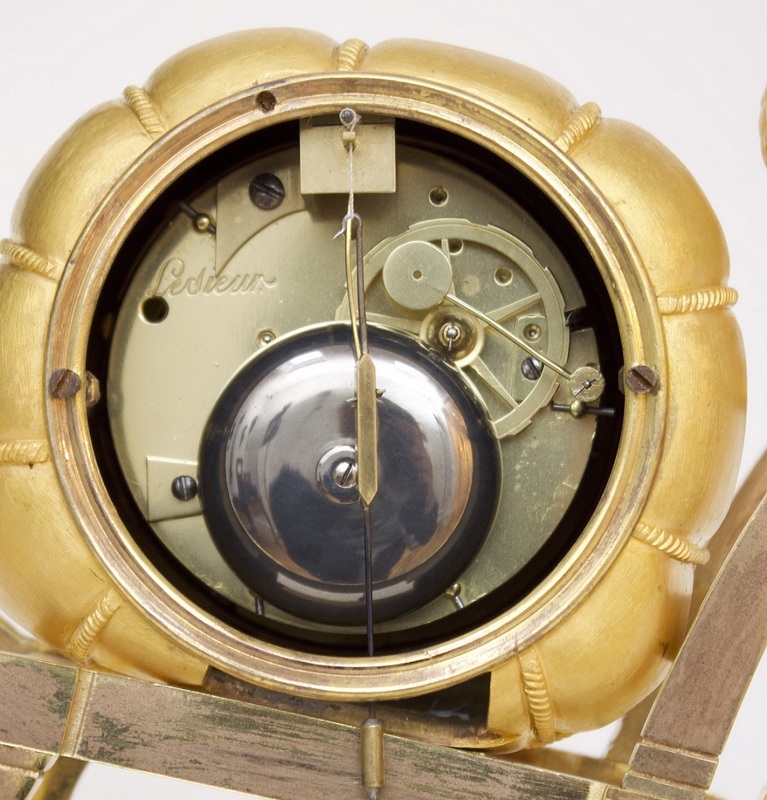 It is being regulated by anchor escapement in combination with a silk suspended pendulum. 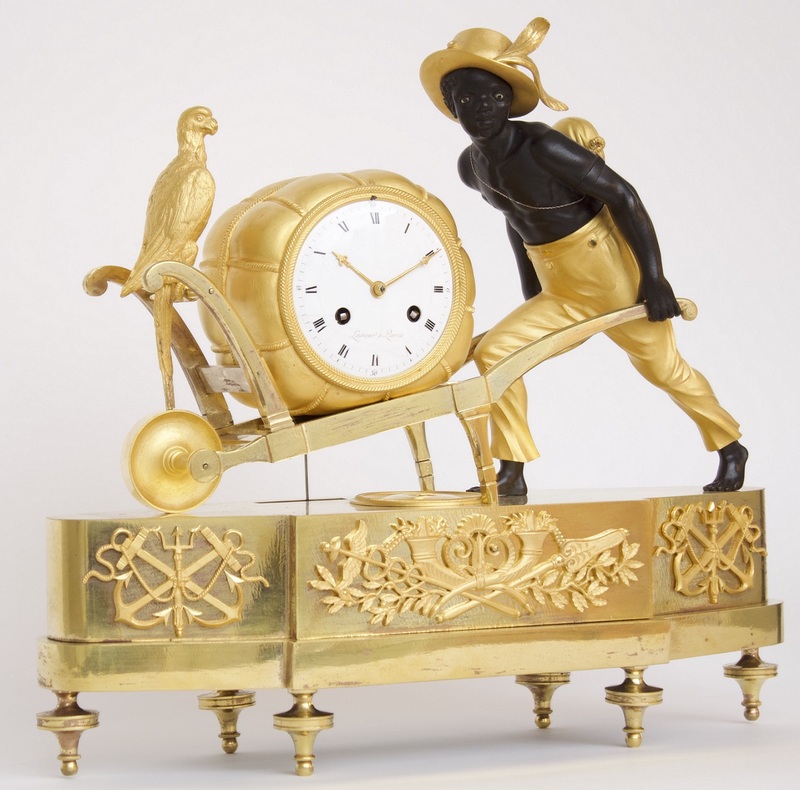 The clock strikes the hours and half hours on a bell by means of countwheel striking. The back plate is also signed Lesieur. 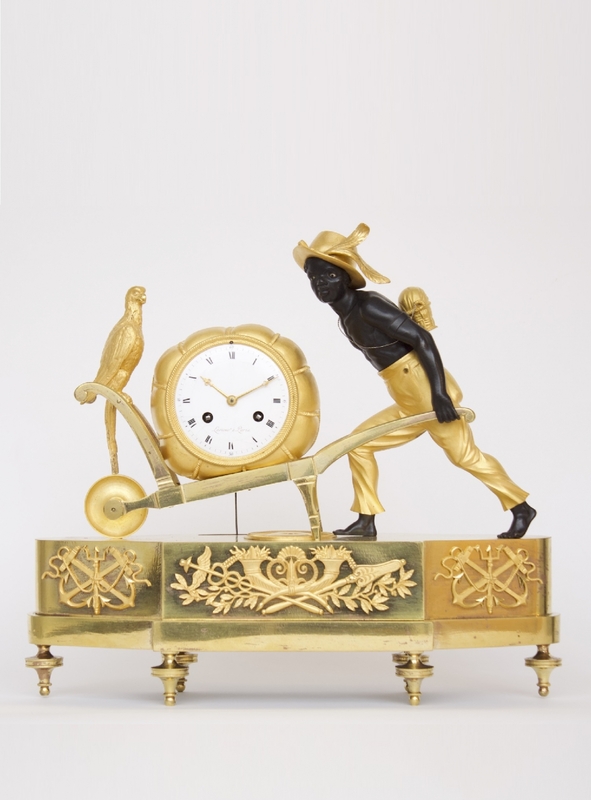 The movement is fitted in an ormolu case shaped as a bale of cotton tied together with ropes. 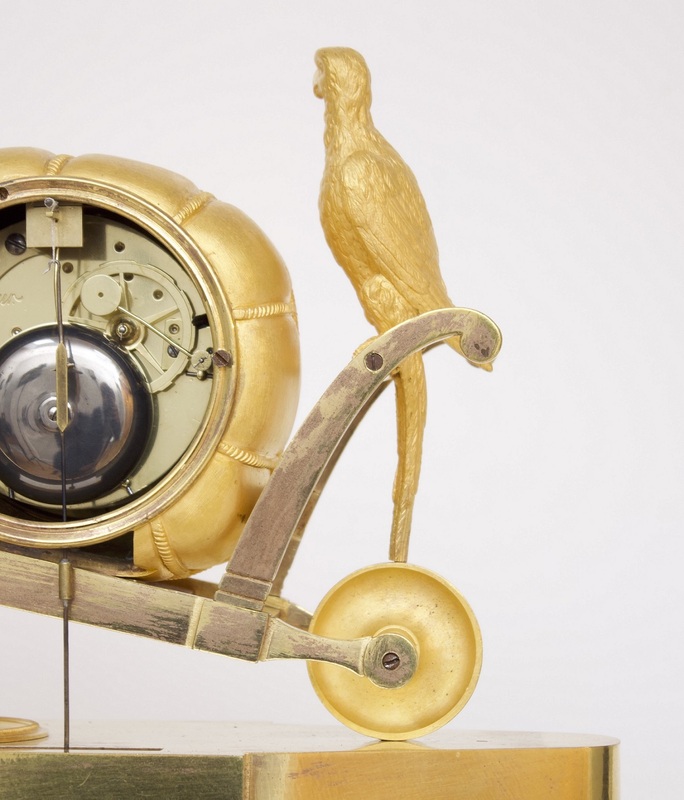 It lays on a well made wheelbarrow on which a seated parrot. 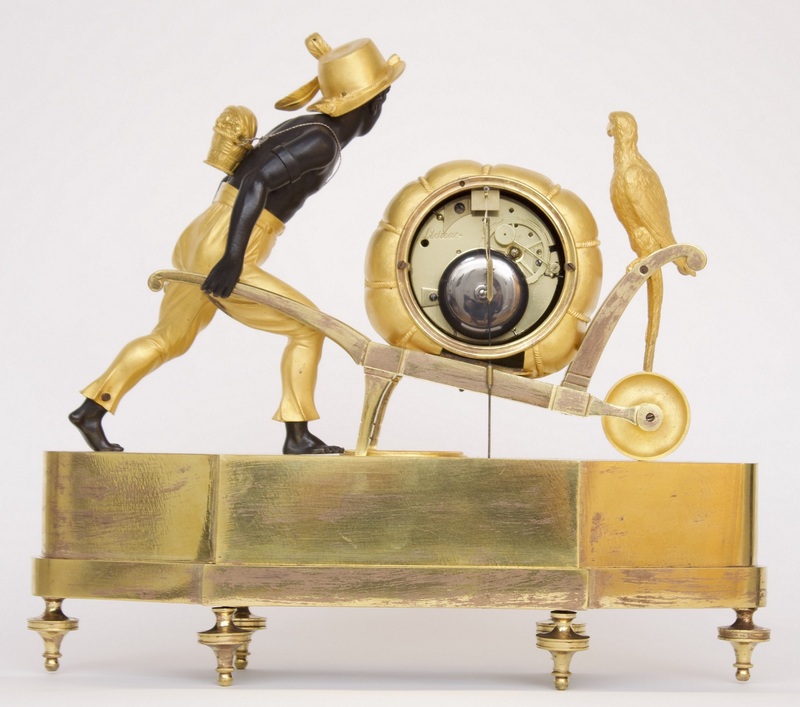 The wheelbarrow is being pushed by an ormolu and patinated bronze ‘bon sauvage’ porter with enamel eyes and wearing a hat. The whole is placed on an octagonal base with lengthened sides. On the sides there are ornaments incorporating anchors, ropes and a trident. With these elements clearly referring to shipping. To the front there is an ornament incorporating horns of plenty, oak leaf, a peddle and a staff probably referring to prosperity and plenty. The clock is raised on eight turned feet. 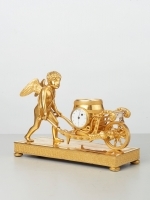 Lesieur is being mentioned as ‘pendulier’ working in the Vieille rue du Temple in 1806 and in the Rue de la Verrerie between 1820 and 1850. Lit; Tardy, Dictionnaire des Horlogers Français, pp. 411.